There’s nothing quite so satisfying as chipping away steadily at a To-Do List! Considering that the Secret Garden Hummingbirds have been flitting about on my Perpetual To-Do List for a long time, this particular finish is pretty darned satisfying, come to think of it! With the second hummingbird completely embroidered, all that’s left are some stem stitch veins on a few leaves. So my next step this morning is to embroider those veins, then remove the piece from the stretcher bars and wash it. It’s been on the frame for over a year, and even though I cover it when I’m not working on it, it will benefit from washing. Then I’ll stretch and block it, take better photos of the whole piece in good lighting, and, finally, have it framed. I’m thinking a round frame with bubble glass (convex glass), though I’m not sure what color wood for the frame. Any thoughts on framing? What would you do with it? If you have any scathingly brilliant ideas, let me know! If you want to see the Secret Garden Hummingbirds Project develop from start to finish, you can find a list of all the articles relating to this project – including the source for the design plus thread colors, stitching tips and the like – in the Secret Garden Hummingbirds project index. Maybe a soft purple or red, that is beautiful. I had the opportunity to see the book, it is a good book. I would sit and look at it all day. It is absolutely gorgeous! That is absolutely beautiful!!! and inspiring. By reading your blog, you have inspired me to embroider a tablecloth which has been in the family since omg! at least 50 years!! My idea is to embroider something representative of my kids and grands ie my daughter and her daughter are both into dancing ie ballet my grand-son is into football those that aren’t into sports well then there is always the zodiac sign for their birthday since it is the tablecloth most used for birthday celebrations and other special events. Great work and thank you for you inspirations! Well done Mary. It is beautiful and its finished! How good must you feel. Stunning! I’m looking forward to seeing it framed, too. It’s gorgeous, Mary! For framing, I would stay away from a coloured frame; there are enough colours in the piece itself. Equally, I would not choose a metallic frame. Instead I would choose something in a dark wood so that the colours within glow out. I was thinking of a pale wood frame but I don’t think it would complement the piece inside enough; I think a pale wood would just wash it out. Simply superb, Mary! What an incredibly colourful feast for the eyes! Congratulations on completing this wonderful project, which has thrilled me from start to finish and for so many hints and tips along the way. Mary, the piece is stunning. I didn’t look to see what your dimensions are, but it sure would make a beautiful stool cover. Lynn S.
Thank you for all your wonderful instructions! Absolutely exquisite. I’m in awe of your talent! can’t remember the size, but an upholstered something, like maybe a footstool in a nursery ….? btw, Mary, it IS gorgeous, but you didn’t need me to tell you that! Absolutely stunning, Mary. Loved this design so much I bought the book and the second, Enchanted Forest. I think the bold colors require a crisp outline; instead of natural wood, I would choose Charleston Green, a green/black color to emphasize the foliage or Black. Thanks for sharing this amazing process…you have encouraged me to pick up my embroidery again. Mary the piece is just beautiful, but I think the beaks are glorious, the colors perfect. Enjoy your site love to see your projects. The piece is shouting for a round or oval frame with very soft colored natural wood, nothing to distract from the beauty of the piece. How about a frame covered in the same fabric to blend with the work? Oh Mary! I think a black frame with the convex glass would set it of beautifully! Superb work, detail and process has been a pleasure to follow. And the end results…..Thank you! Your inspiration for us to complete our work can get no better. Hummingbirds are my favorite birds and here in sunny Florida the ruby throated hummers light up my garden! Your interpretation of these birds is stunning. I think a black lacquered frame would really make those colors pop! Just a white frame Mary??? It’s spectacular! Why can I not find a smile on this? 🙂 Oh computers!! white wooden frames will really make the vibrant colors pop. it looks so springy! As always, I’m in awe!! I hope that one day I’ll have the skill to come close to something like this. As a beginner, I’ve learned so much from your website. Thank you for sharing your knowledge with us. I have been following this project from the initial concept of using the page from the coloring book. Congratulations! This is absolutely GORGEOUS!!! I didn’t know you can still buy bubble glass frames. The hummers are lovely, I think I’d go with a darker frame. Black might be too harsh, perhaps something like a walnut or cherry color? Or for non-wood tones, how about bronze or *maybe* a very dark green. Mary that is stunning! What a wonderful job you have done and well worth the time spent. 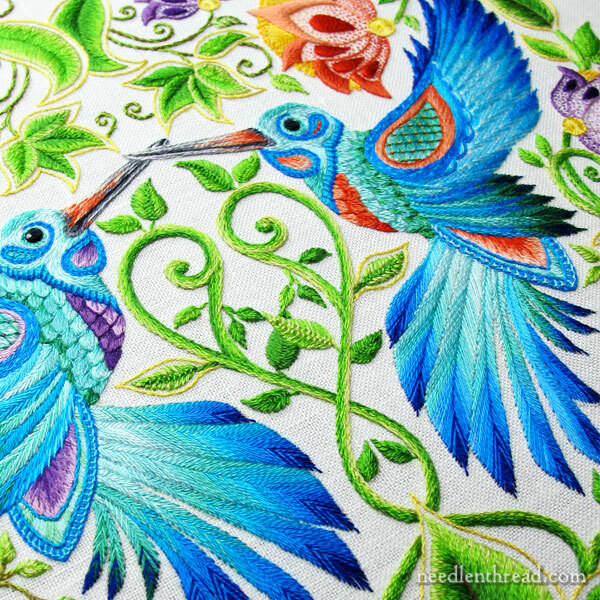 I’m dying to get at my peacock from the same book and planning white embroider on black material. Unfortunately I have had to put it aside as I’m in a middle of moving but planning to be settled enough to begin (and my broken foot healed) to start in another three weeks. Look forward to your daily email in spite of mass confusion amidst boxes both full and empty! Midge, I’m planning to embroider that peacock, too! I haven’t decided on a ground fabric yet, but I’m hoping, ultimately, to use it as a cover for a box of embroidery supplies. I’m dying to get at my peacock from the same book and planning white embroidery on black material. I’m thinking a round frame: either a dark wood frame with a purple mat (like the medium purple in the flowers and the one hummingbird), or else a white frame with no mat. YEAH! Congrats, Mary. What wonderful work you did! I have no brilliant ideas for framing. I would use a round frame with a mat and wood frame. Something soft brown — don’t ask me what kind of tree. You want that gorgeous piece framed, so the mat and frame should do just that, and let all those colors shine forth without detracting from it. This is a really beautiful piece. I’m happy for you to finally have the stitching finished. I like contrast, and I could see this with a darker wood frame, though not black. Either a rich mahogany or dark cherry wood would accent the jewel tones nicely and bring out the depth in the red & purple blossoms. The bubble glass idea is intriguing, and I think it will emphasize the texture of the piece, rather than flatten it. Rather than hung on a wall, I could see this displayed on a plate stand, sitting on a buffet, a console table, or a chest of drawers. To me the piece has an antigue look to it. I definitely like the idea of a round frame. I think a dark wood (not black) would really set it off. Beautiful work! A fire screen or use it on a piece of clothing. Chair, a medallion for a curtain? GORGEOUS! STUNNING! PERFECTION! I’m so thrilled. I’m not sure bubble glass is a right choice though, wouldn’t it distract from the fine details here? I think a lovely Art Nouveau frame would be perfect! Congratulations! Not just on finishing the Secret Garden Hummingbirds but also on the accumulation of ticks on your to do list. SGH is beautiful, I hope that you are pleased with it. I think it would benefit from having a mount around it too – maybe in pale blue. I’m so glad this is at last off your to-do-list, this is truly beautiful I’m so glad you choose the coral for the second bird it’s so lovely and I’m glad you finished it, it was worth the wait to see it completed. I agree a round bubble glass in a wooden frame, dark wood so the embroidered piece would show in all it’s glory, I can’t wait to see it framed. Well done I’m sure you are delighted with the piece and thanks for sharing your completed humming bird with us. Convex glass in a round frame would be gorgeous, but if you want UV-protective glass, you’re out of luck. Also, be prepared to pay B-I-G bucks. I favor a square frame, dark wood with little to no embellishment, and a linen mat with a round opening; non-glare and UV-protective glass. Also of note: Should one ever open ones’ email when the husband is sleeping in on his first day off in three weeks, one should not yell, “THE HUMMINGBIRDS!” when one reads in subject line “Guess what’s finished?” One will end up having to bake a batch of butterscotch muffins by way of apology. It is just absolutely gorgeous! Wow, no wonder it lived on your “to do” list for so long. And thank you for teaching me the stem stitch. One of my faves now. I agree with someone earlier. I would frame it with a dark green/black frame. No more color and not too light. It deserves to be showcased, and the frame needs to “frame” it! congratulations in finishing the piece! It is hard to believe it has been a year since you started it – how many other events, lesson, instructions and thought were shared with us during this past year! The piece is everything everybody said above: stunning, gorgeous, beautiful. I would put a simple darker wood frame and bubble glass – let the colors shine through! How about a metallic gold frame? I think a dark wood frame-probably cherry or mahogany as Dorothy suggested. Something with a convex profile rather than flat-a bit vintage looking to set off the curved glass. It’s absolutely breathtaking! I would lean towards a dark wood frame for the contrast but whatever you decide, it will still be gorgeous! Yay! Well done! Now you’re going to do the other four techniques, right? I think a lovely round cherrywood frame, with your curved glass, would be just what is needed. Since my hummingbirds project is still on the frame (shame on me!) you have given me the gumption I need to get it done! i would suggest you use a dark walnut frame with just a slight bit of engraving in it, something like a twisted rope….or thread! You need simplicity in the frame to set off all the details of your beautiful work. You also need a traditional look, anything bright or ‘fun’ will distract from the piece..
Gorgeous Mary! I stitched along with you on this project and it was so enjoyable. I do hope that you have another stitch along project in the future, perhaps from the new book? I haven’t framed mine yet but will definitely use a round frame. I did find one on-line in a gorgeous shade of green, however, it is very expensive so haven’t purchased it yet. Can’t wait to see what you decide on, mine is laying on my dining room buffet at the moment and I just love to look at it but it does need to be framed. Congratulations, it came out so well, a beautiful project. Wonderful to see you finish, I have so many UFO’s! I think a medium to dark simple wooden frame! Keep it simple is always best. Hi Mary! It may have taken time, but your beautiful Hummingbirds were well worth it! I love how you did your shading. The whole project just glows! Thank you so much for sharing your work with us! Gorgeous !! I would go with a very soft gold not a brassy gold or a very soft golden maple. I love your blog, and this project (I have been following for a while now) has inspired me to go and get this book and the animal kingdom colouring book and try out some of those beautiful pictures. Thank you so much. It looks gorgeous. Keep up the awesome blog. Its so inspiring! This is the project that got me turned onto your blog initially. And has gotten me enthused about trying my hand at embroidery or crewel work. It is divinely gorgeous. Thanks for sharing your immense talent. I would frame in a darker wood frame, double round matting in one of the bird blues. If it were double matted you might not need the convex glass. It is beyond beautiful!! Depending on the room where you plan to hang this I would go for a midnight blue or black frame. I love the circular frame idea, too. I wish you could use something with little pebbles on the frame in keeping with the garden theme to be as a wall. However, it could be to busy and detract from the georgious design. Thanks for sharing along the way. Can’t wait to see the finished beauty! What satisfaction to see this nearly finished work! He needs a beautiful setting, but I do not share your opinion on the choice. The convex glass that you’re thinking will have plenty of flare and prevent a clear view of the embroidery. Embroidery is so rich that I would choose a sober setting, with a flat glass, on a rise. I do not know if “Google” will translate well, but a glass with a space between it and embroidery. With an extensive work like yours requires that the framework is only an enhancement not otherwise. Excuse me for being so direct, but that’s how I see things. Boy I bet that feels great! A very dark brown frame would be perfect imho. Make the colour pop. (A year already? I’m still musing over the pictures in the Secret Garden book.) Your Secret Garden Hummingbirds work is so colorful I think it should be framed very simply–a circular opening in a rectangular double matt; the inner matt a band of one of the blues and the top matt just a bit darker than the linen. The double matt would keep the embroidery away from the UV protected glass. The frame, darker linen with a gold band. Oh, what a lovely piece! If you need a place to hang it up, I have several available. Just a wonderful, wonderful job you’ve done. Try everything!!!! I did a piece that I knew needed to be framed in blue. It ended up in a dark peach/coral frame. The framer was surprised; it wasn’t even an option that she would have considered but it really gave it a pop the blue just didn’t do. Love seeing the finished piece, been watching the progress, for a whole year! Really? I am inclined to agree with the former framer though I think a darker linen Matt would set it off better. Except for some stumpwork I frame glassless. A deep frame with matts might work. I think the rounded glass might be distracting..
Mary, that is so beautiful! Just looking at it makes you feel happy, the colours are vibrant and lively. Thank you for cheering me up! Totally gorgeous, and beautifully done! I’m thinking a dark stained wood to complement the colors without competing. It would make all those wonderful colors really pop! No scathingly brilliant ideas (a line from one of my favorite movies…are you a Trouble with Angels fan also? ), but I think a dark, rich wood might complement your vivid colors nicely. Congrats on finishing it! Mary, it’s beautiful. I love your idea for framing. I read some of the comments and one thought I had was that WHITE can be tricky. So many different “whites” that it might be problematic unless it was trimmed in gold or something like that (frosted, streaked). I always have some of my own ideas when I head to the framer, but then I let her/him suggest ideas to me because they are usually more used to what works well with certain colors and styles. I don’t think I’d want to use black, but who knows. This could get tricky. I love the idea of convex glass (didn’t realize they could do that), but the rest is best left to visiting the frame shop and trying out different ideas. If you’re not sure, and you have to leave the shop and come back again later, why not. Nothing like placing pieces of frame next to the piece and making a decision based on what you SEE. Really a masterful job. I particularly like the beak and feathers below the wing on the bird on the right. The comments above by Liz n. who says she’s done framing professionally are interesting. I also thought you’re probably talking a lot of money to get a custom round frame with convex glass. Didn’t realize that UV protection wouldn’t be available in convex glass. I was wondering if the convex glass would distort the view of the piece. How about a square rosewood frame, mat with circular cutout or mounted under glass in a square wooden tray with circular cutout. It’s beautiful now. I can just see your round frame on a wall in an entrance hall, to welcome visitors to the house with a burst of bright, uplifting colours. The embroidery is lovely. If you are going to use a round frame and bubble glass, I would pick a colored frame – yes there are many colors in the embroidery, but the round frame in a color will be like matting the piece. Since you don’t have to commit to any particular frame ahead of time, try it you might like it. Absolutely love your blogs and website. Look for it daily. The hummingbird project is exquisite! How about considering a beautiful pillow for your living room. It is such a work of art and beautiful!!! An absolutely stunning piece. Takes my breath away. Congratulations on creating (and finishing!) something so beautiful. I might try a rosewood frame. Gorgeous! Stunning! Extraordinary! It would be so easy to go on and on! I love it! I like your idea for a round frame. I’m not sure of the bubble glass, only because I don’t know if it would distort your design, otherwise go for it. As for the frame, I’ve got some ideas, and these are truly fantasy ideas, I don’t know if you could find this. I can picture a 5″ wide circular frame in either metal or wood;or wood with 50 cent wide bronze metal concave buttons. Think that bulleted look.The color would be in the royal blue family with black antique accents. Think peacock. Think your birds. Maybe you could create this look yourself by painting something either custom or premade. Ha ha like you have nothing better to do. But these are just ideas, so the sky is the limit right? I hope we get to see it framed out too, your beautiful, beautiful masterpiece! Oops I meant convex rounded buttons, not concave. Also no mat needed the frame does it all. When I framed a cross stitch family tree for my Mom, I mounted it on acid free foam board, pinning the piece into the foam sides of the foam board with sequin pins,which are tiny 1/2″ pins every third square. I also used the thinnest batting, 1/4″ thick. Find your centers by putting a mental cross hair over the top. Pin the centers first, then jump to the four corners next,then work your way in to meet, on all four sides, more or less, at once. My piece was obviously square, but the same steps would work for round.Then I took it to the framer who suggested using a spacer between the fabric and the frame so they don’t touch. I don’t know what they would do for circular, they might have it.it ended up being perfectly stretched and centered, the slightest bit of puff, enhanced the fact that it was stitch work, and letting the professional finish it off,I bought a custom frame, was definitely worth the extra bucks. Your work deserves the best. I’m so proud for you! What an accomplishment! Please, I’d love to see a perfect photo of the absolutely finished piece. I’ve wanted, with your permission, to make a desk top with this for the longest time. May I? I agree a round frame would be prettiest, though a round mat in a standard square frame is probably more reasonable, cost-wise. Sounds like this will be a beauty framed. I think the dark wood would make the colors of the work stand out the most. You are one talented lady! Wow!! It is so much fun to see this project finished. It is beautiful!! I’m trying to use your project management technique to finish a hand-pieced quilt. I hope it works as well for me. Wow, just gorgeous so glad you completed it. It takes a lot to finish something you’ve enjoyed doing. I must say I’m excited to see any progress on Hazel bloomkamps project ,I’m working on one of hers,and would love to do the one you started. I would go for a rich, red wood. Mahogany, or faux-mahogany, to pick up the rich colours in the embroidery. This is such a fabulous piece, though, that you’ll want to get it right. I am about to embark on my own Johanna Basford-inspired embroidery, though something a bit smaller than this, I think! Mary, I’ll join everyone in saying how stunning this piece is. I agree with those who suggest a dark wood or even black. Anything light, such as blonde or white wood, would take away the brilliance of the colors of the piece, and a colored frame would just be too much color. And definitely wood, not metal! It’s a gorgeous piece indeed! I would probably go with a deep mahogany for the frame. If I could get a round dark cherry wood frame I think that would be my choice. (But would also want to see how other dark woods look too.) i think the reds in the cherry would pick up the oranges in the embroidery. No mat. No glass. Congrats on your finish! Can’t wait to see it in all its framed glory! How many synonyms are there for breathtakingly beautiful? You have earned them all. For framing, I’d heed Liz’s warning that bubble glass won’t be UV protective – a piece like this deserves the best care. Style? Either square or round frame with a circular hole in a white mat (wider mat in a square frame), and medium-to-fairly dark wood, narrow; perhaps curved profile rather than flat, but definitely not fancy. Not black – too heavy – or white – would deaden the jewel colours. Beautiful! Congratulations on completing the biggest portion – there’s nothing quite as exciting as reaching a finish line (except perhaps finally hanging it on the wall! )…Domed glass? Brilliant! Frame – hmmmm…The first color that comes to mind would be something in a golden color to balance the entire piece-there’s not a lot of yellow in it, but it’s important – a softly gleaming golden stained birds eye maple perhaps? Or maybe a low gloss gold leaf? Mary, this is so beautiful!!! I think a round frame in a reddish mahogany would really make the greens pop. Good on you. It’s amazing. Thanks, Kath! G’day to you, too! 🙂 actually, at this point, it’s g’night! I would frame it in an exotic (looking) wood. Since the birds are exotic — I am thinking of some of the brilliant birds of South America — the wood should look like a wood from the rain forest. Of course, the frame can be painted to look exotic; it doesn’t have to be the real thing. Congratulations on getting this project finished. I’m sure it was nagging you a lot, since you were “doing it live” on this site. Congratulations Mary. The Hummingbirds are beautiful. I like the idea of the square frame with a round mat. I am not sure of colours but I would prefer a light wood frame with a soft coloured mat. No frame ideas, just wanted to say it is truly beautiful, However may I say, down here in New Zealand, Auckland. We have an exhibition hung today and one of the prize winners had an additional comment from the judges that the framing complimented the stitching beautifully and so I have to say, take the time, your colour skills are many, your eye is utterly reliable, so be true to your feelings. Mary, I love your daily email. Love seeing this beautiful creation completed. thank you, Sue. Me again. Asked my husband, Chirag, a web and graphic designer who has a keen eye for these things. Absolutely beautiful Mary! Please share a photo when you have it framed. Thanks so much! How about brushed silver, wood for the round or metal for contemporary. Anything that won’t compete with the explosion of color and form. Let the work shine and the framing fade away into the background. Maybe something with a reddish hue , such as teak? or cherry ? to bring out the outer floral colors. anything would be beautiful. its truly a beautiful piece . Absolutely sheer perfection, Mary! I never cease to be amazed at what an artist you are with your “needle n’ thread”. Thank you for sharing this beautiful project. And also, thank you so much for all you do to help us not so experienced folks, learn to do something that we are proud to say, “I did this”. Wow! The hummingbirds turned out absolutely beautiful! I have lots more to learn, but you are truly an inspiration. Thank you! Brava! I have enjoying watching you stitch the hummingbirds and I am so excited to see the piece completed! I almost get as much joy watching you as I do with my own projects! Just lovely. I played with a color editor and surprisingly dark purple (like the flowers) looked the best to my eye. Wonderful….its simply a Master piece. So so pretty. I love it. I like the idea of round frame & bubble glass. I would use dark brown if I were choosing. Have really enjoyed this journey. I would choose one of the colors of thread used and do a color wash on the frame. Here are some tips for creating colour balance with frames. When using bright contrasting colours you should consider the 60/30/10 ratio to balance the colours, for example 60% green, 30% blue and 10% yellow. The colour used in the frame will make that colour stand out more, for example a red frame will make the reds stand out more, and a green frame will make the green stronger. You can use both the frame and the matt to add colour, personally I recommend that the main matt should be off white as this is a contemporary look, with a pop of colour in the bottom matt. (Avoid using pure white unless your piece has pure white in it). In the secret garden blue and green compete to be the dominant colour, so I would select either one of these for the inner matt frame. I would match the main matt to the same shade as your linen and I would draw out the yellow with a simple but broad gold frame. This would create the illusion of the 60/30/10 ratio. In searching Google images for coloring ideas in Lost Ocean, your photo of the Secret Garden hummingbirds showed up in the results. How absolutely stunning, breathtaking! What amazing work. I can’t imagine what it took to embroider such a lovely thing. Thanks for sharing. 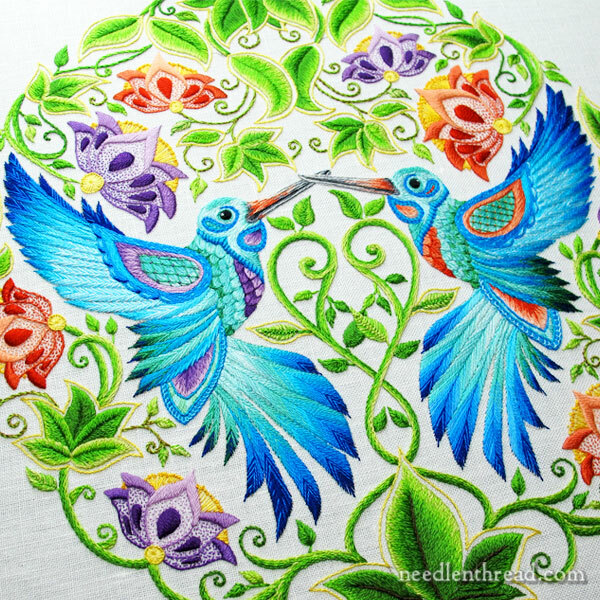 Next Next post: Secret Garden Hummingbirds: Last Stitches, Finished!